Earlier this year, my best friend ABANDONED ME for six whole weeks to go travelling around South America. She didn't even smuggle me there in her suitcase or anything. Still, she did send me hundreds of beautiful photos, and brought back something well worth waiting for: the recipe for Brazil's national cocktail, the Caipirinha! 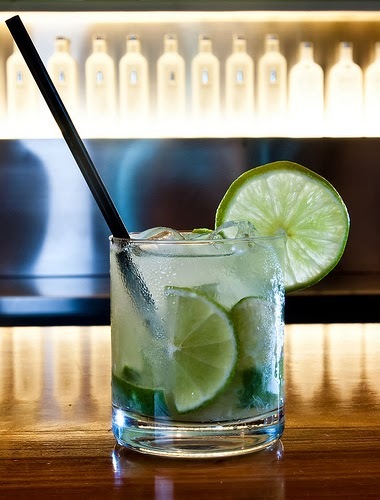 It's a pretty simple recipe but its key feature is the heavenly Brazilian booze, Cachaça, a sugar cane spirit not dissimilar to rum. You can buy a bottle of Cachaça at The Whisky Exchange for £17.95, and it's well worth it, because this is the sort of drink you'll want to make a pitcher of. 1. Pop the lime wedges in an old-fashioned glass, and top with the sugar. 2. Muddle them together with a wooden spoon (or a decent muddler if you have one) for about 20 seconds. This releases all the flavours and blends the sugar with the lime juice. 3. Top with crushed ice, and if you want to dilute the drink a bit then lightly muddle the mixture again. 4. Add the cachaça, and stir well to ensure all the sugar dissolves. Alternatively, you can do all of this in a cocktail shaker, then give it a good shake and pour into the glass.